Federico Monczor was born in 1973 and graduated in biochemistry at the Faculty of Pharmacy and Biochemistry of the University of Buenos Aires (1998). 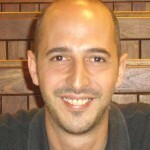 He completed his PhD (2003) as a CONICET fellow, developing his teaching career in parallel. He is currently Associate Professor of Physics and leads the LABORATORY OF RECEPTORS’ PHARMACOLOGY. In his spare time, he enjoys his family, cooks homemade pizzas, and when he has the opportunity he goes trout fishing to the patagonian lakes with friends. He can assemble the Rubik’s Cube (magic cube).